The Centre for the Study of Conflict is a research centre based in the University of Ulster. Its main work is the promotion and encouragement of research on the community conflict and to this end it concentrates on practical issues to do with institutional and community structures and change. It publishes papers and books arising out of this work including: a series of research papers particularly designed to make available research data and reports; a series of Majority-Minority reports and a series of occasional papers by distinguished academics in the field of conflict. 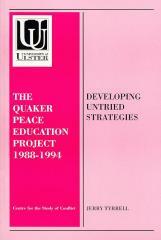 This report is a new publication by Jerry Tyrrell on The Quaker Peace Education Project, 1988-1994, which looks specifically at the role of QPEP in bringing peace education into the classroom. The report investigates adult and child education and the important role which teachers have to play in the process of peace-making. This is one of a set of new publications which the Centre will produce over the next few months on topics such as Parades, the Role of the Police, Classroom Mediation and Sport and CommunityRelations in Northern Ireland. 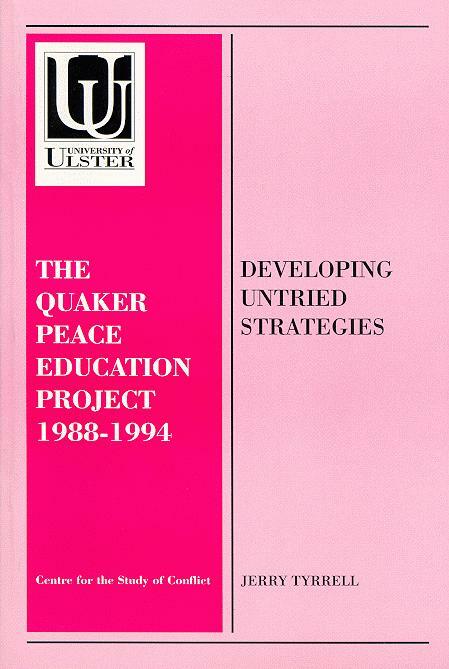 The Quaker Peace Education Project (QPEP) was born out of a challenge at a 1984 conference organised by the Ulster Quaker Peace Committee (UQPC). The response from the conference was a recommendation that UQPC become involved in peace education, and a working party was set up to explore the feasibility. The Ulster Quaker Service Committee (UQSC) by comparison adopted a much higher public profile, with its work at the Visitor's Centres at the Maze prison and at Maghaberry, and other social action projects. By the end of the 1970's UQSC had a substantial budget of tens of thousands of pounds, whereas UQPC had a minute annual budget. A further constraint on UQPC was that there are at least two strands within the Society of Friends in N. Ireland, which sometimes have an uneasy relationship. The concern of the evangelical strand would be that the gospel be preached as part of any Quaker Project. The second, more liberal strand was represented by the social action projects undertaken by the UQSC. The working party from the 1984 conference organised a one-day conference in June 1985, to explore a possible role in peace education for UQPC. Representatives of Education and Library Boards, University of Ulster, Corrymeela, Community Relations in Schools (CRIS), Peace People, Department of Education Northern Ireland, the Society of Friends, and other agencies were invited. Sixteen people representing thirteen agencies attended, in addition to the four members of the planning team, and three members of the Quaker Peace Action Caravan (QPAC). John Lampen6 recalled ten years later that already a specific Quaker role was being stressed, particularly in relation to teachers who were "afraid of, or hostile to, EMU". There was an expressed need for a full-time paid person, as opposed to ACE workers. The project shouldn't "be set up to produce curriculum materials"; rather there was an emphasis on "interaction with teachers." Because of work being done by the Peace Education Board in Belfast, it was felt there was more scope for this type of project in the North West. * Collating and disseminating information on existing resources. * Visiting schools and mounting events in schools in collaboration with teachers. * Establishing on-going groups of like-minded teachers. * Arranging the provision of skills-training for peace-educators. * Providing a measure of consultancy and feed-back to established and developing ventures. * Researching the effectiveness of strategies already being employed in peace education. * Identifying and developing untried strategies. * Seeking to enter into dialogue with those hostile to peace education. The idea of a link with the University of Ulster developed after the conference, largely on Andrew Young's initiative. Negotiations started between UQPC and UU and were protracted; originally UQPC wanted the field officer to be an UQPC employee within the University. This issue was resolved by setting up a Management Committee with four Quaker members, three University staff, and one representative of the Peace Education Board of the Irish Council of Churches and the Irish Commission of Justice and Peace (Education Board). A Quaker would chair the committee. This was a compromise that would "enable UQPC to honour its obligations to (those) who have financed the Project"8 while foregoing its original intention of being the legal employer. The project received substantial financial support from Quakers in Britain and Ireland. Although other sources including the Ireland Fund and the Commission of the European Communities provided funding, the bulk of donations were from Quaker individuals, Meetings and Trusts. By the time the staff was appointed in April 1988, sufficient funding had been raised by Andrew Young or promised for the first three years of the project. Once QPEP was set up, neither UQPC nor Andrew Young as its chairman, used its power to intervene. The Trusts required UQPC to update them on the progress of the project, with the Joseph Rowntree Charitable Trust making it a condition of its grant that the project be periodically evaluated professionally - it had accepted that the overview of progress by members of the University will meet this need.11 The day to day running of the project became the responsibility of the Management Committee, and the major contribution of UQPC was in raising the funds, and getting the project off the ground. In September 1993, the Ulster Quaker Peace Education Project embarked on a pilot peer mediation project with two primary schools in Derry. At the same time the draft CES evaluation of QPEP was being produced, and some of the initial recommendations, particularly with reference to action-research were being made known. The Pilot Peer Mediation Project benefited from the learning involved. In 1993 it was decided to devote QPEP's annual P7 Conference to the theme of "Peer Mediation".3 Participants observed a demonstration of mediation, and had an opportunity in role-plays, to try it for themselves. Some teaching in the basic techniques was offered. In addition a brochure entitled "Conflict Busters"4was distributed. The Principals of the Model Primary School and Oakgrove Integrated Primary School responded positively to a subsequent invitation to all Derry primary schools to participate in a pilot peer mediation project. One Principal in particular was influenced by the enthusiastic feedback provided by his school's delegates to the P7 conference. Using Elliott's definition of action/research as "the study of a social situation with a view to improving the quality of action within it",5 QPEP had as its immediate research objective the development of a process which would inform the action - specifically the training of children in mediation skills. After each workshop the children's evaluations were collated into a usable form for the planning of the next one. As the workshops progressed, the questions in these forms enabled the facilitators to obtain indications as to the learning acquired, 'gaps' in the learning, and the needs of participants. Classroom work, for each of the periods between workshops, was examined and fed back into subsequent planning. Regular contact was maintained with the teachers, and with the Principals, as well as a formal meeting to review the training and discuss the establishment of the mediation programme in their schools. For a pilot project of this nature the provision of parallel initial training for an entire P7 class in each of two schools, had numerous advantages. Both were 'ideal' schools in many respects. QPEP had already established a good working relationship with both schools. A vital objective of the project was to demonstrate that peer mediation can work, Another was to identify what would be required of a prospective school in terms of commitment from Principal and Staff, before attempting it there. It needs to be stressed that neither Principal had heard of peer mediation in schools before. Most of the QPEP team were experienced in using QPEP's workshop model for the development of affirmation, communication and co-operation skills. However the team's first Training Day began with quite frank acknowledgements of scepticism as to the feasibility of peer mediation and of personal doubts as regards competence. Fortunately, one team member with considerable mediation training experience was available to lead the training sessions. Handbooks and training schemes from other projects were useful resources. Input on the first Team Training Day on the basic format of mediation processes was helpful as a structure from which to develop a process for use by children. The childrens' training programme - of six 105 minutes workshops to take place once per week in each school between October and December 1993 - was devised. An overall course syllabus to fit this schedule was drawn up. The format of the training sessions of the QPEP team consisted of team members 'doing' the kinds of exercises which were being envisaged for the children. Then through analysis and evaluation, the team designed the exercise for use in the childrens' workshops. Trialling in the use of fairy stories as the basis of role-plays indicated that they could be very effective indeed in seeing the same incident from two perspectives. As the childrens' workshops progressed, a number of dilemmas surfaced and were addressed in team training and planning, including the fact that childrens' mediation does not mirror adult practice. Children are more concerned with restoring friendship - or at least peaceful coexistence -than with tying up all the issues in a formal agreement. Continued evidence of the children's innate skill and intuition indicated that the team's primary challenge was to trust the children to find their way of proceeding. It was also crucial to convey to the children that the common conflicts of school life would be treated seriously, rather than being minimised by the grown-up world. The workshops taught mediation skills in the context of the themes of affirmation, communication and co-operation. The P7 teacher in each school played one of the roles in "The Old Woman and the Woodcutter" conflict (the Hansel and Gretel story), in the first round of workshops. The exercise, though well-prepared, was deliberately unrehearsed in terms of final outcome and came across as very real. Evidence of children's interest came quickly. The children were soon involved in role-playing the conflicting parties, with the mediation roles played by a QPEP facilitator assisted by another child. All the children were then involved in the development of ideas as to how the mediators might proceed. As the workshops progressed the childrens' participation expanded. The small group format was increasingly used so that each child would have opportunities to practise being mediators. At the final workshop actual conflicts (involving children who were present) were mediated; this led to a particularly popular workshop. The evaluations and feedback of the six workshops indicated gaps in the training and other needs. These included the need to establish that the parties were taking part in mediation by choice, the distinction between mediation and arbitration, more practice for the children in framing the issues, and further exploration of the range of techniques for finding solutions to problems. These issues were addressed in the joint training day that had been planned from the beginning. Classwork indicated an excellent level of understanding overall and also of motivation, including a distinct preference for peer mediation above having teachers or parents involved. The importance of "keeping secrets" and the significance of resolution being achieved by the conflicting parties, were acknowledged by the children. The children at both schools recognised the need for mediators to have trust, honesty, fairness, listening skills, patience, confidentiality, and helpfulness. All but three of the children in both schools agreed that they would like to see a peer mediation project in their schools. However the final question, as regards possible problems with a mediation programme, indicated impressive realism on the part of the children. Each school was keen to establish the service, with 12 to 15 children functioning as mediators on a rota system. Both schools had similar plans for the regular debriefing of mediators, and arrangements for the safe keeping of records, statistics and copies of agreements. It was agreed that peer mediation should not be compulsory and other avenues remained open to an aggrieved child. Within the QPEP team there was concern around the process of selection of mediators. It related to the pattern in education of the "brightest and best" being selected, whether for grammar school or to represent the school in competitions, and the psychological effects on those (consistently) not selected. Both schools opted for a peer selection process, with minimal intervention by teachers, and for only those selected to participate in the joint training day. Among those chosen as mediators there were a few whose behaviour had given cause for some concern. They proved excellent as mediators, and their behaviour improved noticeably. This suggested that the project had potential to significantly address issues of behavioural change, through encouragement of children who were regularly in and out of conflict, to be mediators. It has been borne out by experience in other parts of the world that successful peer mediation schemes depend on this poacher-turned-gamekeeper' factor. The P7 teachers and playground supervisors involved, in both schools expressed great enthusiasm for exploring the possibilities of the project in this area. It was considered important to ensure that what would be asked from the schools in respect of our research requirements would be kept to an absolute minimum. A prime consideration was that the nature of the project itself required special sensitivity since it touched on the school's discipline policy and practice, and current methods of dealing with conflicts. The confidentiality of mediation proceedings had been stressed in training and it was felt that adults sitting in on mediations would both confuse the children and be intrusive to the fledgling programme. The research function operated in tandem with the on-going support which QPEP gave to the schools during the second and third terms. During the second last week of the school year, individual interviews were conducted with the Principal, the P7 Teacher and the Senior Playground Supervisor in each school. In February 1994 the scheme was introduced at both schools. This was done through explanation, role-plays and responding to questions. It was noted that the mediators became progressively more competent in their presentations and grown-ups were impressed by how impressively they fielded questions. At this stage P7 children were the most frequent users of the scheme - and the mediators among them were very willing indeed to use it for the resolution of their own conflicts. At one school the P7 class teacher was immediately impressed by the thoroughness and patience with which mediators exercised their role. He also noted the transfer of skills to other areas of the curriculum and of the quality of interactions in general in the classroom. The mediators would be completing their primary education in June and both schools envisaged the programme continuing and becoming integral to the life of the school. The induction of the P6 children, who would inherit the mediation role in the following year, therefore required attention. QPEP facilitated workshops for all the P6 children in both schools during the last term. From the beginning of the pilot project it became apparent that insufficient account had been taken of the crucial role of Lunch time Supervisors; and that they ought to have been involved in the training programme and consulted during the planning of the schemes. Lunch and playtimes are major occasions of conflict and also appropriate times for the provision of a mediation service. These are also the periods when children are the responsibility of the Lunch time Supervisors; their work gives them unique insights as regards individual children and the dynamics of relationships between them. With minimal briefing on the programme while the training was in progress, it is significant that they became fully involved in the provision of the mediation services from the beginning. Those in charge of supervision in both schools expressed interest in participating in training in future and willingness to attend outside their working hours. Both women acknowledged their scepticism towards the idea on first hearing about it, yet became enthusiastic supporters of it on seeing it in operation. The issue pointed up the fact that the establishment of a peer mediation programme opens up the entire field of whole-school relationships - between children and adults and among adults. As regards the latter it challenges conventional hierarchical structures based on the identification of the teaching role as being on a different level from that of other roles. The programmes operated during the last two terms of the school year. The services of mediators began to be used quite quickly, particularly among the P7 children, but increasingly involving the P6 children at The Model. There was resistance however among the P6 children at Oakgrove, frequently expressed through faking conflicts for the fun of being mediated! In both schools the P5 and P4 children gradually began to use the scheme. There was no conscious decision to exclude younger children, but rather a feeling that in the first year it would be best to see how it would work with the senior children. Their only contact with the programme in its first year was at the Assemblies at which it was introduced. After the initial interest however the number of mediations requested decreased. A number of reasons for the lull were identified. The more time elapsed after the initial launching and introduction events, the more the programme got lost and forgotten about - a pointer to the need in future to maintain promotion. But a fundamental reason has to be the failure of the Project to involve the Lunch-time Supervisors right from the start. Impetus was greatly restored to the programmes following the work-shops for the P6 children. Though the focus of these was on the next school year, when the participants would become mediators, an immediate outcome was the number of mediations increasing, and this level was maintained until the end of the year. The workshops brought the P6 children 'on board' and they began to use the service as they had not done previously. It also gave their teachers direct experience of the programme for the first time. They were very positive indeed about it. The Principals' end-of-year assessments were extremely positive as regards the increase in skills, confidence and competence of the children and the programme was found to have more than met their expectations for the first year. The P7 class teachers involved were of the opinion that playground incidents were reduced as a result of the programme. The Senior Lunch time Supervisor was even more certain about its positive impact, pointing in particular to the unusual calmness in the concluding weeks of the school year, which are usually volatile. The comments of adults in general about the maturity which the mediators demonstrated, relate to several factors. One was their ability to distinguish the conflicts that should be referred to the teachers. Another was their patience with the parties, a quality that was extensively tested. The childrens' use of their own initiative both in bringing conflicts to mediation and in their handling of difficult situations, was frequently evident. The single biggest challenge identified by the mediators was to maintain neutrality in the context of the diversity of their relationships with various disputants. Several children had experience of being both mediator and mediated. From the interviews it was clear that though some admitted to feeling 'strange" whether in mediating a dispute involving a classmate or in being themselves mediated, they had coped well with such feelings. For both teachers and principals there was complete agreement on the need for detailed planning of the year ahead. It would have to include components for promoting the involvement of ancillary staff and of teachers of children other than the Primary 7s. and raising awareness among parents and school board members. It would also include strategies for increasing the programme's accessibility and visibility, and not least to the younger children. Both schools were clear about the need for continued external agency help in the establishment of the programme. The relationship of the programme to Education for Mutual Understanding (EMU) and to the N.Ireland context in general featured strongly in the reflections of principals and teachers. Both schools had a strong commitment to the promotion of EMU and were in the forefront of the search for authentic ways of delivering it. Their enthusiasm for the peer-mediation programme related to its being a practical way of delivering EMU. With one year of the pilot project completed, substantial evidence emerged to indicate that the concept of a peer mediation service in primary schools is indeed feasible, given certain conditions. Immediate and long-term benefits Apart from what it offers to children as preparation for life, it can be of real and immediate benefit to everyone who is part of the life of the school. Children are empowered to contribute to developing the happy environment which is so crucial for learning. Conflict is a recurrent reality in human encounters. The results of this pilot project argue for the recognition of 'conflict literacy' as an important component of education. When seen in this wider context it may be necessary in future to guard against mediation coming to be seen as a specialist skill, as the preserve of experts. It will be important to offer the training to all the children in a class or even a school, although only some may have the chance to function in the school's formal mediation service. It will also be important to locate the programme more clearly in the context of all relationships within a school. It was a peer mediation programme - but of at least equal concern must be teacher-pupil relationships. There is a much greater power imbalance in these than is likely in peer relationships and teacher-pupil conflict (especially in secondary schools) may often be a much greater area of tension than inter-pupil conflict. As a pilot, peer mediation project, in two primary schools, the project was small but it could contribute significantly to the process of developing mediation practice throughout the education system, embracing all in-school relationships, and feeding into the promotion of a conflict resolution culture in society. That a peer mediation service be established in schools in N.Ireland. That interested schools be made aware of what would be required of them and a negotiated contract signed by the school and any outside agency. That as many children as possible be trained in each school; that appropriate procedures be developed for the selection of those who will function as mediators, and for those not selected to have complementary functions in the service's provision. That Northern Ireland based resources be developed. The service's development crucially requires an action/research process. Interested schools should be made aware of the research requirements of the agency. Contractual arrangements in respect of these should be negotiated at the beginning. That an external agency or agencies be established to assist schools in the development of recommendations 1-5 over the next five years (1995 - 1999). This concluding chapter summarises the development of QPEP from an idea at a conference to a full-blown action research project; and points to the future direction of the work under the auspices of the EMU Promoting School project. QPEP quickly found its niche in the tradition of experiential peace education projects, arguably being more at home in the mores of informal adult education, than in an academic institution. For example its work with life prisoners at Maghaberry prison stimulated and informed its work, and was one field where it was not perceived as preaching to the converted. The initial emphasis on action rather than research, and interaction with teachers rather than developing curriculum materials, reflected the aspirations of those involved in setting up the project. It also suited the modus operandi of QPEP for pragmatic reasons, the first QPEP team being recruited and trained to run workshops rather than be researchers. Nevertheless in the context of Elliott's definition of action research, from the outset QPEP used evaluation as a means of action research; creating the potential for more focused research. This too was in the tradition of experiential peace education, as epitomised by the Kingston Friends Workshop Group who had a seminal influence on QPEP. Experiential learning lends itself to action research, although it was argued that QPEP was workshop driven, and inadequate priority was given to reflecting on its action. Gaps in reflection were indicated when staff and volunteers became aware of mistakes being repeated, and workshop programmes being recycled instead of involving innovation. Nevertheless the regular use of undergraduates from the peace and conflict studies course, enhanced the research aspect of the project. More could have been done to reciprocate this, through greater involvement of QPEP in the delivery of the MA and BA. The broad remit of trialling and developing untried strategies of peace education, gave QPEP scope to take risks, make mistakes and respond to requests. It had a key role in developing the work of NCBI in N Ireland. It worked in close collaboration with other agencies, notably PACE, Co-Operation North, in the development of new approaches to existing programmes that addressed diversity issues. It helped to introduce Alternatives to Violence Project (AVP) to Northern Ireland. Above all it raised the debate about conflict resolution skills in education, and consistently heralded the underlying philosophy of affirmation, communication and co-operation. Initially QPEP was such an unproven resource that it was only through existing links that individual staff had with schools that it could get into schools at all. The first phase, notable for the way in which the QPEP team of staff and volunteers were established, and the far reaching role they had, was an opportunity to create an abundance of expertise and experience in conflict resolution skills workshops. This coupled with a growing awareness of the unease that some teachers had for more interactive education, enabled the project to focus more clearly on the needs of teachers in the second phase. This was given added relevance by the growing recognition that for teachers to be effective in EMU they had to be comfortable with the emotive and affective aspects of learning. At the same time, QPEP's research illustrated the fact that stress was often the most pressing issue for teachers, and that any INSET provision from QPEP had to reduce stress to be credible. In a sense the acid test was whether teachers were able to incorporate individual activities in the classroom. Although not curriculum specific, the booklet of conflict resolution skills, "Wee People", that QPEP produced was a popular resource for teachers. The lack of production of curriculum materials - although never an expressed aim of the original project - was a key issue that galvanised the promoters of the follow up project "the EMU promoting school" to have this as a target in its first three years. Throughout the project the role of volunteers was critical, and brought with it strengths, particularly in establishing a rapport with young people, and weaknesses in as much as volunteers were perceived by teachers as being young and casually dressed. For their part the volunteers, several of whom had negative experiences of schooling, did not make easy allies of teachers. Nevertheless the sheer commitment, energy, enthusiasm, and professionalism of the volunteers helped to overcome initial resistance. As the project progressed it built up such a level of confidence and competence amongst its volunteers that new volunteers joining the work were able to enter at a higher level. For some volunteers it felt like being thrown in the deep end, but there was a consistent feeling that the antidote to the feeling of "not knowing it well enough" was learning by doing it. Invariably volunteers gained confidence, and usually found their skills were relevant to other areas of paid work, some going on to get jobs as a result. The international dimension of the volunteers particularly evident by the regular placement of Eirene volunteers with the project, was appreciated by the children in particular. This international influence was furthered by the work that QPEP did in Israel, Germany, Belgium, Byleorus, Uganda and elsewhere. Leading an experimental, experiential project, led to tensions between volunteers and staff becoming a source of conflict. This was not anticipated at the outset. Mechanisms for dealing with internal conflict need to be built into the structure and day to day running of any future project continuing this work. It may be a counsel of perfection, but the idea of "remaining with a conflict" until it is dealt with is at the heart of peace education. A key role of QPEP was to support teachers, and throughout the project it did endeavour to elicit the thinking of teachers, and explore the rationale for the variety of responses it got. The issue of "control", and the apparent lack of it in a classroom workshop was one of the recurring issues that was flagged early in the life of the project. Almost inevitably children found themselves being mandated to attend workshops, this was not so much a problem with younger children for whom the novelty made up for the compulsory nature. Sixth formers, particularly those for whom QPEP was at best a second choice activity, took more time to come round. In the first years of the project, QPEP was so pleased to get a foot in the door of schools, that it would respond positively to all requests from schools. The first series of workshops it did set the tone for the rest of the project, and the support of the schools involved helped to encourage the work further. Andrew Young and the Ulster Quaker Peace Committee as sponsors of the project enabled the staff and volunteers to concentrate on developing the work, without the worry of raising funds. The second phase of the project brought European recognition through the PSEP funding. By the end of the first phase QPEP had developed a reputation for delivering conflict resolution skills workshops, and it could afford to be proactive in developing partnerships. One school where it was to explore a whole school approach was the newly opened Oakgrove Integrated Primary School. It was in a position to explore new avenues, such as using older children to work with younger children. Research became more structured, ensuring that individual workshops in a series were evaluated in such a way as to impact on the subsequent workshops, taking into account but not being constrained by, for example, the expressed fears of the teachers. A major event in the second phase of the project was the ENCORE summer school, which illustrated QPEP's ability to take on something new, and create a dialogue in the process, in this instance between practitioner, academic and policymaker. For some participants there would have been more merit in opportunities to share difficulties, rather than attending workshops that were familiar, or at a skills level they had already achieved. Although the ENCORE summer school was to be a shop window for a number of workshops particularly appreciated by practising teachers, it was only towards the latter part of the project, with the extensive impact of the pilot peer mediation project that teachers became actively involved in the development of QPEP's work. Arising out of the ENCORE summer school was the link with Manchester Development Education Project's Values and Visions project which was to form the basis of one of the two strands of the EMU Promoting School Project. The aspect of QPEP's work which was to give rise to the most soul searching was its role in developing the work of NCBI in Northern Ireland. Two years into the project, research was suggesting that QPEP and teachers modify the NCBI model to suit their needs. The overall evaluation spoke of a heavy reliance on NCBI. The debate epitomised the growing awareness within N. Ireland generally of the tendency for US models to be prescriptive rather than elicitive, and the challenge that presented. The need for training to take cognisance of where participants are starting from, particularly where the process engenders strong feelings, and for participants and trainers alike to be clear about their mutual expectations, is paramount. The experience of playing a leading role in developing NCBI work in N Ireland gave QPEP an opportunity to reflect on and research into the nature of resistance to experiential approaches, particularly among teachers. The Joseph Rowntree Charitable Trust's concern that the CES Evaluation of QPEP should look at the impact of the organisation, helped ensure that the evaluation focused on strategy for the future. As a result of the evaluation's far reaching recommendations, an internal consultation and one with external organisations led to a proposal for future funding for a new project. In 1994 the Positive Ethos Trust was set up to sponsor the "EMU promoting school" project. The latter will continue, in a more focused way, the work that QPEP began. Conflict resolution skills training will have peer mediation as an end result, and INSET training will have as a goal the enhancement of EMU at the heart of the school ethos. Funding is being sought for a three year project. It is yet to become clear whether QPEP's body of expertise in education internationally will be made use of by INCORE. The new project, which is also an action research project at the Centre for the Study of Conflict, will have more involvement of teachers at staff level. It will have as a target the trialling and production of a package centred on the curriculum. The process of developing this will be optimised by ongoing self-evaluation to ensure that targets are reached. A management committee will be established with a clear mandate, and an explicit lines of communication. In a very real sense although the Ulster Quaker Peace Education Project came to an end in December 1994, the full effect of its influence as an action research project is in the legacy it leaves in the form of the EMU Promoting School Project. 1 "Ulster Quaker Peace Education Project". Paper prepared for the Management Committee of the Ulster Quaker Peace Education Project, by Ulster Quaker Peace Committee, March 1987. 2 Lampen, John, (1994) Interviewed by Jerry Tyrrell, Derry 3.3.94. 4 "New Quaker Initiative - Peace Education in N.I" The Friendly Word, March-April 1986. 5 "Annual Report 1992/93" (1993) Ulster Quaker Peace Education Project, Derry. 7 "New Quaker Initiative - Peace Education in N.I. ", Ibid. 8 "Ulster Quaker Peace Education Project", Ibid. 3 QPEP Annual Report 1992-3 pp19-20.